It has been more than 80 years since Valasek first recognized the existence of a dielectric analogue to ferromagnetism, ferroelectricity, in Rochelle salt. Much as with semiconductor research, the initial studies of ferroelectric materials focused on homogeneous materials. Unlike semiconductor research, however, which rapidly expanded into n- homogeneous structures and devices, investigations of compositionally graded and layered ferroelectrics have been relatively recent endeavors. Indeed, many of the most significant results and analysis pertaining to polarization-graded ferroelectrics have only appeared in publication within the last ten years. Further extensions of these concepts to the general class of order-parameter graded ferroic materials, as depicted on the cover of this book, have (with one exception) been totally lacking. It was thus with a great deal of excitement that we assembled the manuscript for this book. The primary focus of this study is directed toward polarization-graded ferroelectrics and their active components, transpacitors; however, the findings presented here are quite general. The theory of graded 2 and 5; whereas, much of the ferroics is put on a solid foundation in chapters introductory material relies more heavily upon analogy. 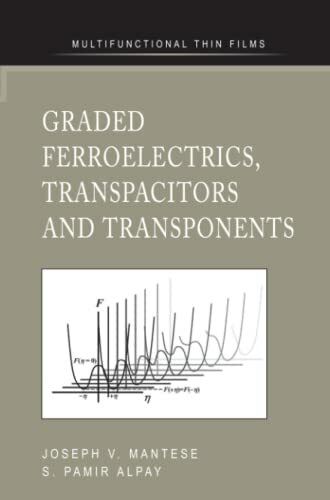 This was done so as to provide the reader with an intuitive approach to graded ferroics, thereby enabling them to see heterogeneous ferroics as clearly logical extensions of passive semiconductor junction devices such as p-n and n-p diodes and their active manifestations, transistors, to: transpacitors, transductors, translastics, and ultimately to the general active ferroic elements, transponents.